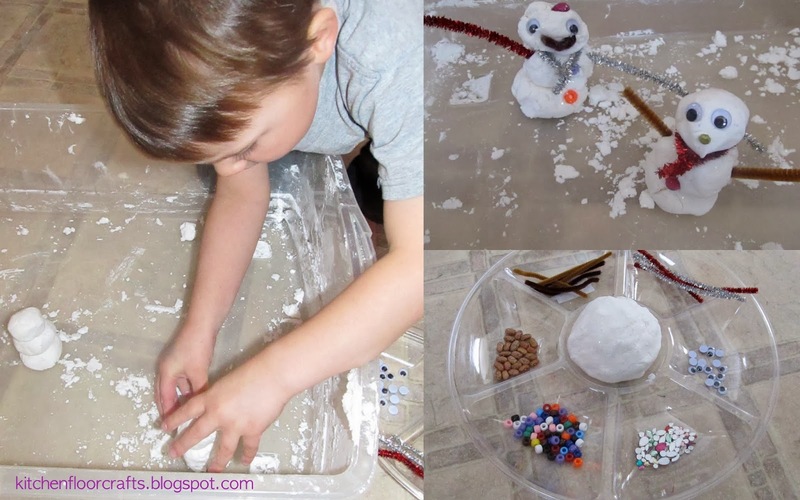 A few weeks ago we made Sparkle Snow Dough which proved to be a lot of fun. Big Brother's only complaint was that it didn't seem "cold" like real snow. 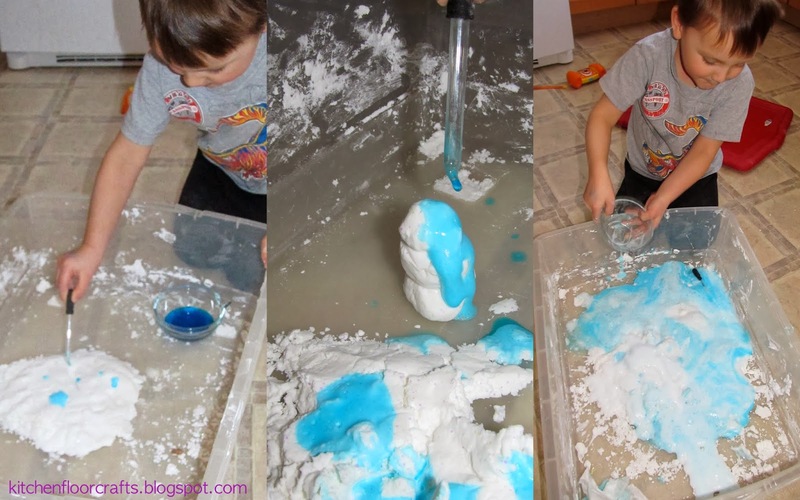 This lead to some searching on the internet and Pinterest which helped us to this recipe for Erupting Snow. Although there seemed to be similar recipes out there, this was a great fit. We're simply calling it "Cold Sparkle Snow Dough" here. The ingredients are simple: shaving cream, glitter, and baking soda. We used a 1 lb. box of baking soda, and would highly recommend using a larger box. We wound up adding in some cornstarch when we ran out of baking soda, and although it still worked, it did change the texture a little. First we dumped in the baking soda, followed by the glitter. Afterwards we squirted in the shaving cream. We used a little less than half a can total. Then we mixed the ingredients with our hands. This part got pretty messy. At first it was sticky and very gooey, but as we mixed it we were able to start forming a ball. The mixing itself was fun and the mixture felt really cool as it went through different stages. Finally we had something we could mold into a ball, and play with in other ways. The dough smelled great (we used original Barbasol shaving cream) and felt even better. It was cool to the touch and light when held in your hand. It felt like snow, but it didn't get your hands freezing and wet. After we played with it just as a dough, we started having fun by adding in other materials. First we made a bunch of snowmen and pulled out some craft supplies to decorate them with. Next the snow dough became a winter playground for monster trucks. If the dough started to get a little dry we would just add in a little more shaving cream and remix it. At the end, we colored some vinegar blue and used it to "melt" the snow and snowmen. Because of the baking soda in the recipe, the snow would bubble and ooze as the vinegar touched it. Definitely a new favorite sensory material for winter play in a variety of ways!